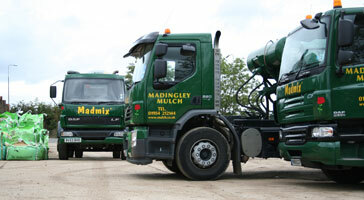 Operating from a base just outside Cambridge, concrete suppliers Madmix have a fleet of 6 cu metre and 4 cu metre barrel truck mixers, all designed to carry your required load of ready mix concrete. When arranging a concrete delivery, please ensure there is significant access to your site or property to enable our driver to deliver to you safely. Please note we do not drive the trucks off hard-standing ground. Customers ordering trucks to do this do so entirely at their own risk. If the truck is able to suitably position itself at right angles to the job, the concrete chutes have a maximum reach of approximately 2.4m. This distance is reduced to around 1.3m if the truck is only able to draw alongside the job. 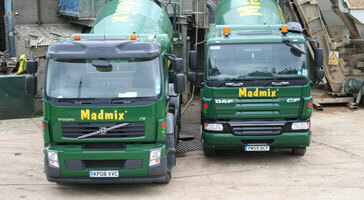 Please allow a minimum of 3.2m (2.9m for our small mixer) for the vehicle to enter an opening, such as a gateway. This distance will need to increase if the vehicle cannot approach straight at the opening.